- CAD to hold gains over USD until end of March says J.P. Morgan. - Before Congressional fight over NAFTA derails Loonie in the summer. - But USMCA ratification will happen and CAD recover into year-end. The Canadian Dollar is likely to cling onto its position as the best performing currency in the G10 universe for the time being but the summer months will see renewed weakness push Loonie exchange rates lower, according to the latest forecasts from J.P. Morgan. Analysts at the global investment bank say the Loonie is currently tading in line with its short-term "fair value" even after the stellar run that has propelled it to the top of the G10 league table thus far in the New Year. In other words, it is not yet overvalued. "Economic surprises have faded, GDP forecasts have been downgraded, and short USD/CAD positions offer no carry," says Daniel Hui, an analyst at J.P. Morgan. "USD/CAD is sitting 0.8% cheap to our STFV model which pins the pair better justified to be trading around 1.33, our current 1Q target." 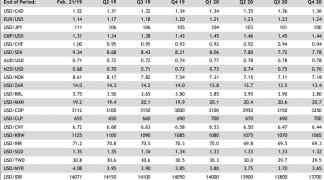 Canada's Dollar has risen to the top spot in the G10 ranks despite an economic backdrop that appears to have gone from bad-to-worse during recent months, with the USD/CAD rate now down -2.7% for the 2019 year-to-date. An 18% increase in the WTI oil price and a more docile U.S. Dollar have enabled the Loonie's rebound from December 2018 lows but J.P. Morgan says currency will run out of road before the end of March, and that renewed weakness will weigh on Canadian exchange rates during the second quarter. 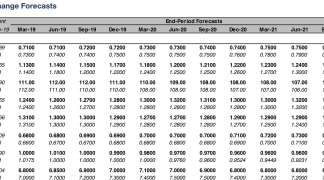 "We reiterate our forecasts and recommendation to target weaker CAD mid-year before recovering into year-end. The mid-year 1.35 target is predicated on a deteriorating US-CA rate spread differential (from ~50bps end-1Q back to 70bps) as the USMCA process stumbles and shifts the BoC into downside risk management from policy normalization mode," Hui writes, in a research note. Fresh uncertainty over the future of trade relations with the United States is anticipated later in the year, which J.P. Morgan says will hurt the Loonie by forcing the Bank of Canada (BoC) to remain on the sidelines as far as its interest rates go until the United-States-Mexico-Canada-Agreement ratification process is concluded. The opposition Democratic Party siezed control of the House of Representatives following last year's midterm elections and the new lawmakers took up their seats this January. They are now expected to make trouble for President Donald Trump and Canada later in the year. Democrats have said Trump's renegotiated North American Free Trade Agreement (NAFTA) does not have adequate provisions to enforce labour and environmental standards, while some have complained that it won't remove U.S. tariffs on imports of steel and aluminium from Canada. This is after the U.S., Mexico and Canada spent a year negotiating the new pact at the behest of Donald Trump, who threatened during his presidential campaign to terminate the accord if terms more palatable to him could not be agreed during his time in the White House. "The first month of divided government has proven toxically partisan. Thus, Democrats are likely to drag their feet on this in the first half of this year, and if forced to consider the issue, have precedent to derail the approval process, effectively delaying the approval altogether," says Hui. Opposition lawmakers say they will vote against the deal's ratification if the above parts of it are not renegotiated again, which could give rise to a period of heightened uncertainty during the summer when the pact is expected to go before Congress for approval. Republican Party lawmakers also have their own gripes with the deal but the rub for Canada's Dollar is that unless the USMCA deal is ratified, North American trade would remain governed by NAFTA and President Donald Trump has said he will terminate the old accord if Congress does not pass the new one. "We see at least the threat of withdrawal as a rather high-probability outcome and thus expect confrontation to heat up towards the middle of the year, with any brinksmanship scenarios playing out into Q4 before ultimately avoiding the cliff-edge and ratifying NAFTA's successor, the USMCA," Hui warns. A decision to terminate would set the clock ticking on a six-month countdown period to exit day, which would still allow time for USMCA to be approved by Congress but would leave the Loonie shrouded in uncertainty for months. All of the uncertainty over NAFTA will impact the Canadian Dollar because of the effect it will have on the outlook for Bank of Canada monetary policy. Losing NAFTA would mean slower growth and lower interest rates over the longer term so markets would "price out" the one BoC hike they currently see happening in 2019 following a trade upset. That would imply a 0.10% widening of the two-year U.S-Canada bond yield differential in favour of the American greenback, which Hui says would push the USD/CAD rate 1% higher. However, Hui also says there'd be a "poltical risk premium" priced into the Loonie as well, which would add another 2% or so to the USD/CAD rate. "USMCA will ultimately be ratified before year-end and NAFTA risks fully unwound," says Hui. "Our year-end forecast is tweaked slightly to 1.28 (prior 1.29) to account for a more dovish Fed against a more confident BoC. Oil remains a two-sided risk for CAD at this juncture." 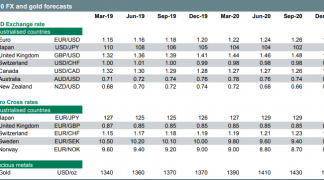 Hui forecasts the USD/CAD rate will hold around the 1.33 level until the end of March, at which point it is seen rising to 1.35, where it will stay throughout the second and third quarters only to decline sharply during the final months of 2019. J.P. Morgan's year-end forecast is 1.28. 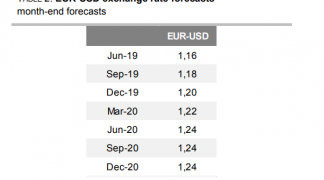 The Pound-to-Canadian-Dollar rate is expected to hold the 1.70 level until the end of March before rising to 1.79 by the end of June and 1.80 in time for the end of September, although the rate is forecast to end 2019 at just 1.74.